By Guest Blogger: Edward Collins, BIHR Human Rights Champion. A little over a month ago, Human Rights Day was celebrated across the globe. 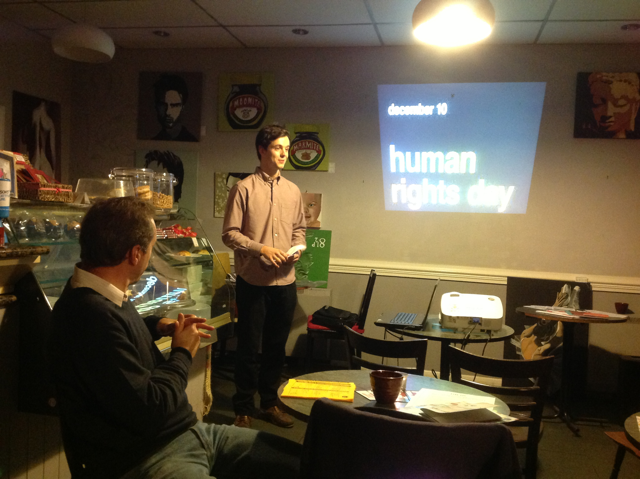 I would like to take a (slightly belated) opportunity to briefly tell you about my own Human Rights Day, which I spent working as part of BIHR’s network of local human rights ‘Champions.’ My task was to hold an event in my local community to mark the day. This is what I got up to. I live just outside of Tunbridge Wells in Kent, and work for a café in the centre of town. 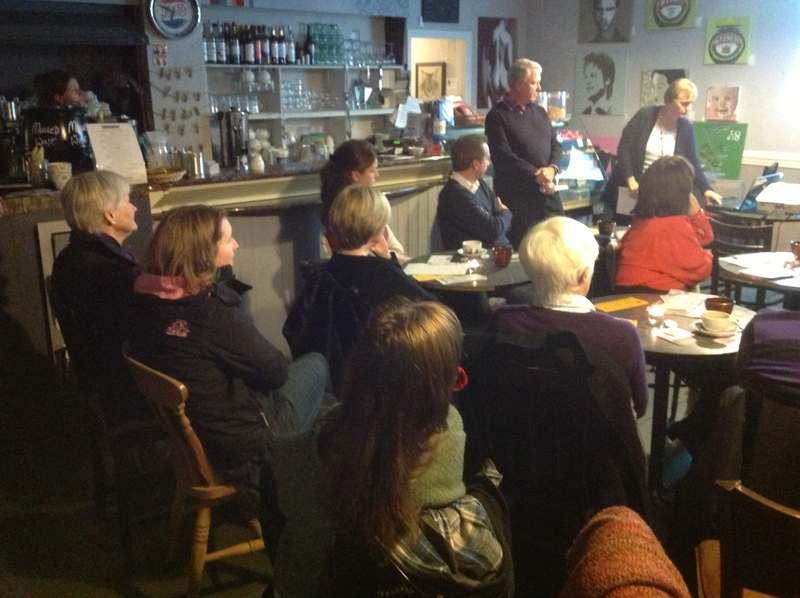 The café is a friendly venue with great community links, so I decided to host my event there one evening. I was aware that ‘human rights’ have sometimes suffered a poor public image and I wanted to instigate some debate which might help to change this. I organised live music, guest speakers and audience debates, all of which centered around the question, ‘what are human rights doing in Tunbridge Wells?” I put up posters and Tweeted as much as I could to promote the event, and soon we had lots of people coming into the café asking questions and expressing interest. On the night, we had between 20 and 25 people come from around Tunbridge Wells. It would have been great to have had more, but it was quality not quantity! 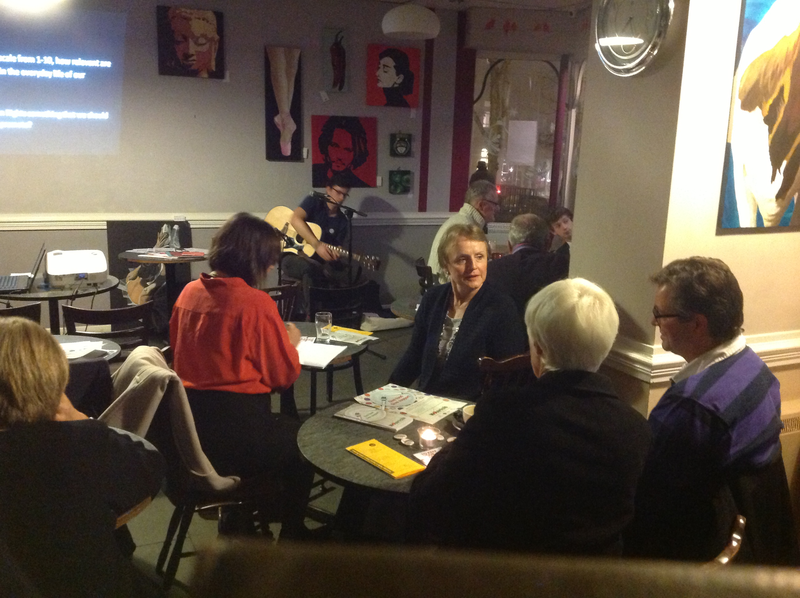 The number filled the café well and a nice atmosphere was created with an acoustic set from local singer/songwriter James Phippen. The evening began with the audience dividing into groups of four or five people and we started by trying to define ‘human rights.’ After this, everyone had a go at rating the importance of human right protections in the local community on a scale from one to ten. The initial scores were fair and people mostly agreed that rights are important, however, there was a tendency to see this importance as simply theoretical. The practical use of Human Rights protections was perhaps seen as less significant in our community because of a lack of awareness of its occurrence. Additionally, negative press coverage may make people feel uneasy about this matter. Next, we heard talks from representatives from the Citizens Advice Bureau, Age UK and a local homelessness shelter the Tunbridge Wells Churches Winter Shelter. Each organisation talked about the work they do in Tunbridge Wells and raised awareness about the groups of people they help in our community. The talks were centred around the theme of human rights and it was made clear that numerous groups within our community regularly need help to gain access to basic rights. The representative from the CAB made it particularly clear that, in some circumstances, appealing to the Human Rights Act is the only way to achieve this. I also talked a little about the practical uses human rights protections. I mentioned their ability to act as a safety net but also as general guidelines to help improve standards of care. To back these points up, I gave plenty of practical examples that I had learnt about through the BIHR. After this, we went back to our debating groups and it was great to see a change in perception about practical human rights protection. People were keen to stress that although Tunbridge Wells is often seen as a ‘well off’ area, there are in fact a considerable number of people living in relative poverty, an issue exasperated by the area’s comparatively high living costs. The audience was agreed on the importance of not ignoring those who do not have access to various rights we often take for granted. Thus, we came to the conclusion that the importance of practical human rights protection lies in safeguarding the voice of the more vulnerable members of our community. As such, to miss the significance of practical human rights protections is to turn a blind eye to these people. Throughout the evening, there was a lot of interesting and meaningful debate. One particularly lively discussion occurred between the representative from the CAB who specialises in housing needs and a member of the audience who used to be in charge of a local housing organisation. People were also keen to talk about the social responsibility of rights holders towards other rights holders, especially in situations where individual rights come into conflict. One final positive outcome of the evening was that a local student approached me, wondering whether I might be able to repeat the event at his school. So, with a bit of luck, I will start getting the preparations for that going soon and so continue my human rights ‘championing’ into 2014.